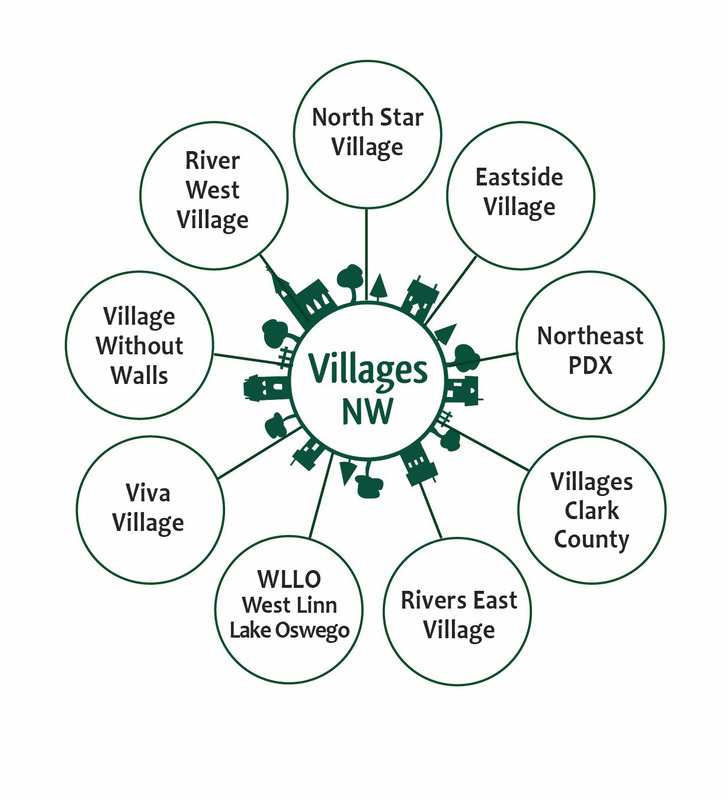 Villages NW is a nonprofit organization based in Portland, Oregon whose mission is to enable more Pacific NW residents to successfully age-in-place by developing & nurturing a network of sustainable, community-based Villages throughout the region. Villages NW serves as Village Without Walls’ nonprofit hub and fiscal sponsor. In 2015, Villages NW, our hub, was named Best New Nonprofit by Portland Monthly Magazine! The Villages NW Hub and Spoke Network has experienced exciting and explosive growth during its organizational development. At this time, with the help of Villages NW, seven Spoke Villages are accepting members and three other Spoke Villages (WLLO (Lake Oswego/West Linn), Village at the Falls (Oregon City) and Rivers East (Milwaukee, Gladstone and unincorporated Clackamas County) – offer social activities and are looking for volunteers to help them launch. See the Villages Map page. Educate the public about Villages as a critical, cost-effective piece of the aging-in-place puzzle. Catalyze the emergence of new Villages by assisting Village founders to develop planning groups in their own NW communities. Provide Village planning groups with targeted coaching and tactical support at each stage of their Village’s development. Fast track the Village creation process by sharing materials, resources, best practices and “lessons learned” among NW Villages. Develop Villages NW into an effective regional resource, connecting all the grassroots Pacific Northwest Villages. Serve as information central for the regional Village movement, publicizing NW Villages’ events, presentations, and programs open to the public. Advocate on behalf of the NW Villages, locally, regionally & nationally. Explore cost-savings and economy of scale efficiencies that can be achieved by collaboration among NW Villages. Negotiate key strategic corporate and organizational partnerships and apply for funding on behalf of the NW Villages. Establish a hub and spoke network model for Portland metro-area grassroots Villages, reducing costs, providing key organizational, HR, financial & administrative services, and eliminating the need for each Village to acquire its own 501(c)(3).